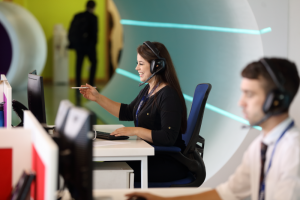 At UKFast, providing outstanding technical support for our clients is always a top priority. But, to be able to support you the very best we can, we need the very best in the business to coordinate, train and motivate our tech teams. For this, we have our Director of Technical Support, Martyn. Who is Martyn? What is his UKFast story? Let’s find out. Martyn, what roles have you been involved with since you started UKFast? “I first arrived at UKFast around six years ago. Since starting my first position as a Junior Windows Engineer, I’ve had a few different roles. “As a Junior Windows Engineer, I answered client calls, completed support tickets and started troubleshooting and diagnosing problems. I then moved onto being a POD Engineer, where I started working with larger clients and more complex solutions. What’s it like being a director? “In December 2018, I was incredibly proud and surprised to be given the title of Director of Technical Support. My role means that I’m in charge of making sure the technical support teams are working the best we can. I look after all of our engineers, both Linux and Windows, making sure everyone is providing incredible support for our customers and always looking for new ways to improve things. What are your three top things you’ve learnt on your UKFast journey? “It’s something that we say a lot here, but it’s so important to never stop learning. When I started at UKFast, I’d had around eight years’ experience in IT. I thought I already knew most of what there was to know about technology. But being in such a fast-paced business, one that is constantly improving and innovating, made me realise that there’s always something new to learn. That’s what’s always made working at UKFast so exciting for me. “The second thing would be to always start your day with a list, though I understand this won’t work for everyone. I always start the day by writing down my goals to achieve that day and then prioritising them. I receive so many email requests along the lines of ‘can you just look at this?’ and I find myself distracted by all these little tasks. By having a list of top priorities, makes it easier to stay on track and get the crucial things done. Finally, what are you excited about in 2019? “Due to the fantastic way 2018 finished, I’m really excited for 2019. We spent much of last year cleaning up all our processes and focussing on the future, so for me this year is about seeing the results of that hard work and really getting everything right. “I’m also excited for our apprentices and taking more apprentices into the business. I love how they come in with no knowledge of tech and before you know it they’re working with servers and doing things that it took years for me to move onto. Their confidence grows so quickly with their knowledge – I love it when they come to me with questions that I then have to research myself! Find out why our award-winning support has an NPS score that’s ten times higher than the national average.